get the blues, go through hard times, and doubt themselves. 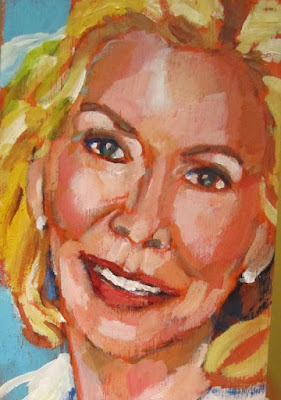 Louise Hay popularized the idea that it is okay to love yourself. with accepting and loving yourself. were like magic for me, ended all my self scrutiny and worry. here in Toronto. I didn't intend to sell the work, and did not. was of Louise Hay. I would have loved to meet her. know that wherever you are that is true. Have a caring for others and loving your life day. What a beautiful post Barbara! I too read a book in my younger years that was a revelation in understanding that we have control over what we think. I also got a lot out of Louise's book. You have captured her perfectly in your inimitable style. You really do create magic with your portraits! You have honoured her well. Hope all is going great with you and yours! Hm. I think I should get a copy of that book--I am too self-critical and it holds me back! Love the painting--what great colors in her hair! Thank you so much. I've been thinking of you. We landed in New York City yesterday and Steven and I were talking about how much we enjoyed dinner with you. I hope you are well. I think you have my email. Write if you can. all start with accepting yourself. I love your work so much. It is wonderful.